청계산 중턱의 청룡사에 자리한 탑으로, 보각국사의 사리를 모셔놓았다. 보각국사(1320∼1392)는 고려 후기의 승려로, 12세에 어머니의 권유로 출가하여 승려가 되었으며, 이후 불교의 경전을 두루 연구하여 높은 명성을 떨쳤다. 특히 계율을 굳게 지키고 도를 지킴에 조심하였으며, 문장과 글씨에도 능하였다. 조선 태조 원년(1392)에 73세의 나이로 목숨을 다하자, 왕은 ＇보각＇이라는 시호를 내리고 탑이름을 ‘정혜원륭’이라 내리어 탑을 세우도록 하였다. 탑은 전체가 8각으로 조성되었는데, 바닥돌 위에 아래·가운데·윗받침돌을 얹어 기단(基壇)을 마련하고 그 위로 탑몸돌과 지붕돌을 올려 탑신(塔身)을 완성하였다. 기단은 모서리를 둥글게 처리한 8각으로, 아래받침돌에는 엎어놓은 연꽃무늬를, 윗받침돌에는 솟은 연꽃무늬를 새겼다. 가운데돌에는 사자상과 구름에 휩싸인 용의 모습을 교대로 새겼다. 탑신의 몸돌은 각 면마다 무기를 들고 서 있는 신장상(神將像)을 정교하게 새겨 놓았으며, 그 사이마다 새겨진 기둥에는 위로 날아오르는 이무기의 모습을 역동적으로 표현하였다. 지붕돌은 여덟 귀퉁이에서 높이 들려있는데 마치 목조건축의 아름다운 지붕 곡선이 살아난 듯하다. 태조 3년(1394)에 완성을 보게 된 이 탑은 양식상 종모양이 주류를 이루던 시기에 8각의 평면을 이루는 형식으로 건립된 몇 안되는 탑 가운데 하나로, 조선시대 전기 조형미술의 표본이 되는 귀중한 유물이다. 또한 탑 가득히 새겨진 조각과 둥글게 부풀린 외형이 어우러져 화려함을 더해주고 있다. 탑신의 기둥과 지붕의 곡선, 그리고 지붕 귀퉁이의 용머리조각 등에서 목조건축의 양식을 엿볼 수 있어 당시의 건축과 비교하여 감상할 만하다. 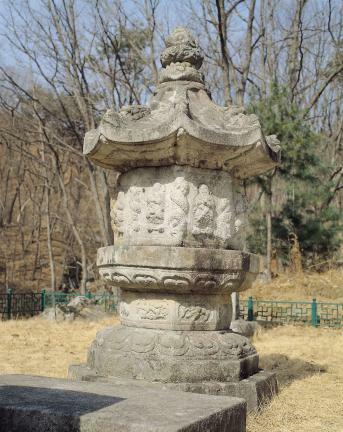 This octagonal stupa dedicated to State Preceptor Bogak is located at Cheongnyongsa Temple which lies on the mid-slope of Cheonggye Mountain. 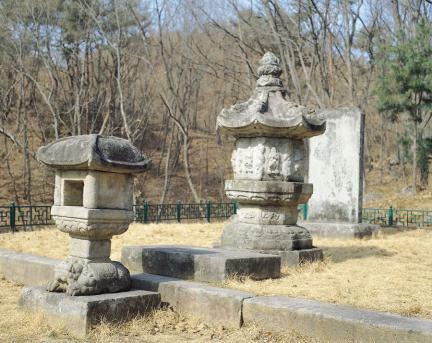 When the preceptor passed away at the age of 73 in 1392 (the first year of King Taejo, the founder of the Joseon Dynasty) the King ordered the stupa erected and named it Jeonghyewolyung. This stupa is octagonal in shape. The main body, with a roof on its top, stands on a three-tier pedestal beneath which is laid a stone platform. 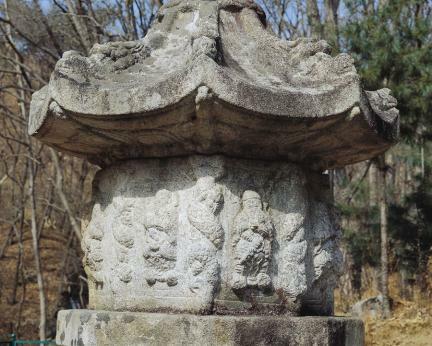 The corners of the octagonal upper base stone are rounded. 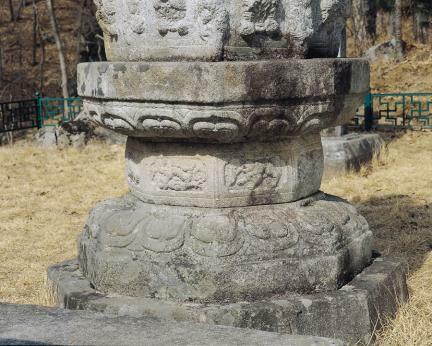 Lotus flowers are carved on the lower and upper base stones. 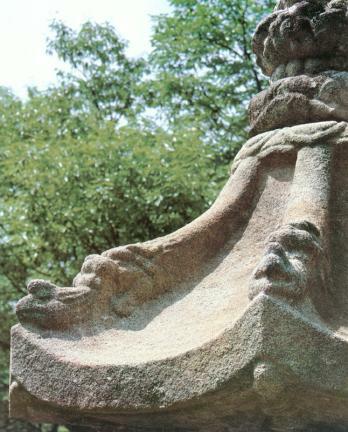 A lion and a dragon in clouds are engraved alternately around the middle base stone. 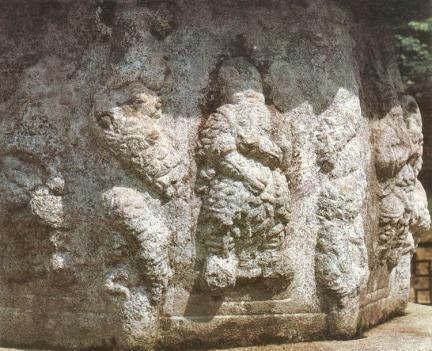 On all sides of the octagonal body are elaborately carved eight guardian generals bearing weapons. An entasis column is carved at each corner of the body. An imaginary snake is winding around each column. The roof is beautifully upturned at the corners of the eaves, patterned after wooden architectural structures of the period. Dragon's head is carved on the corners of the eaves. 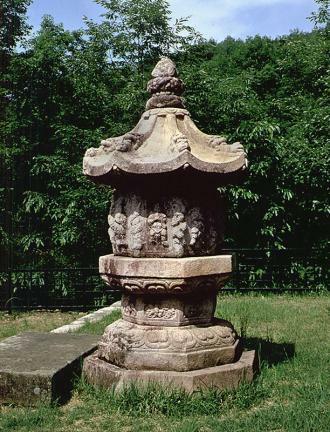 Built in the third year of the reign of King Taejo of Joseon (1394) when bell-shaped ones prevailed, this octagonal stupa, with its unique shape and excellent sculptural workmanship, is a representative example of early Joseon formative arts.